Review of the gig on the previous post. The first question you might ask me could be this one: “How was this interview organized?” I actually can’t believe my luck. It happened that I met by chance the community manager of Gaîté Lyrique and social networks specialist Mr Thomas after a conference at this venue last Tuesday night. He kind of suggested me to do an interview with Peter, because no journalist or music blogger requested any interview with him as far as he knew. 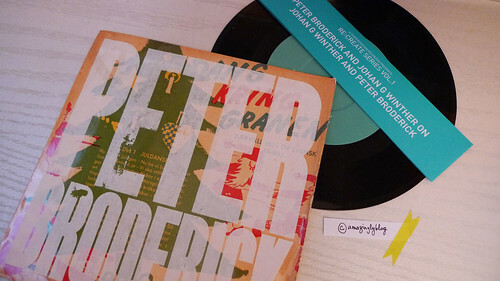 I really really like what Peter does and met him once at his Paris gig last year. I didn’t know that it was possible to do this, as Amazinglyblog is a tiny blog, and not a popular music webzine, you know. You can easily imagine how glad and excited I was then, because it was the first face-to-face artist interview I've ever did. Chantal: Thank you so much for agreeing to be interviewed! 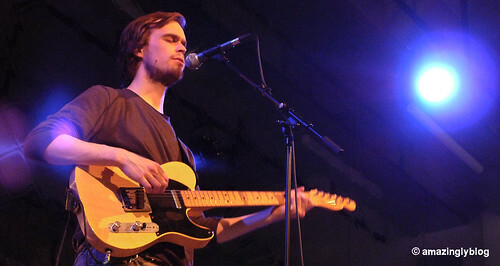 [for people who don’t know who is Peter Broderick] First of all, could you introduce yourself shortly? Peter: Yes. My name is Peter Ray Broderick, I was born January 20 1987, I was raised in the US and now I’m living in Berlin. C: How did it happen that you played a gig at la Gaîté Lyrique? P: Actually, it’s quite simple. The guy who’s organizing this show and creating the schedule, his name is Zach Miskin. He’s musician as well. We’ve been in touch in the last months, he started to work here and asked me if I would like to play a concert. And I said: “Sure!”. C: What do you think about this place? Peter: I think this place is very special. I’ve never really seen a place like this. It’s so set up for all kinds of art. It’s really inspiring. I was talking to the director about maybe coming back, ‘cause they also do artist residences here and it seems like the perfect space to stay and work on something, get inspired. I love this place. C: Does it remind you any other places you’ve been to? P: I mean, I know other buildings that are multicultural and that have many different stages, but I’ve never seen one like this. Have you been all around, the place? P: Yeah, those little room is beautiful. C: You were part of the Euro-tour for Efterklang’s film " An Island". How was it? How do people welcome it? P: Ok. That concert was really really nice. 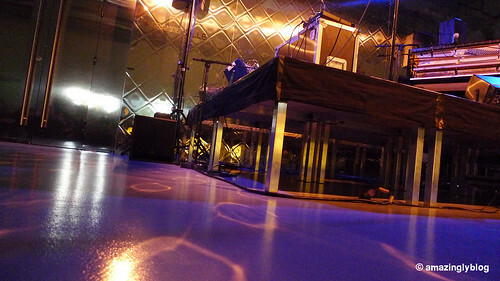 We played just on the floor and this place with people litterally standing inside the band. Between me and the singer, there were five audience members. That was really really fun. But the film has been really nice. To make it, it was really an amazing experience working with Vincent Moon. He’s a man with vision and I trust his vision very much. So to work with him was very inspiring. And then I was kind of surprised how well it works screening it before a concert. I was kind of worried that it was maybe too much playing. But it worked very well, because the film is quite slow and a sort of build-up really. C: What is it about? P: The film is based on an island in Danemark, where some of the band members grew up. So out, in the countryside in Danemark. The whole thing is basically us exploring that area performing songs and in different spaces, and also just working purely with sounds, like, sometimes a sound that is banging around on doors. And we’re trying to explore the island musically. A song is being performed and there’s a special thing like their parents joined us on one song, all the parents were sitting there and playing along. We played a show at their grade school where they grew up with children singing along like little 10-year-old kids, and also with high school kids. So different very special scenarios to play music. C: That’s interesting. There are rumours that Efterklang will take a break. P: Yes, they’re doing a break to work on the new record and take a little time off the road. C: Will you collaborate with them later again? P: I’m really not sure at the moment. I mean, this is kind of their thing, whenever they want to have me, I’d be very glad to join them, it’s their band and I’m sort of coming on the outside, sort of helped them to fill their musical vision or whatever you want to call it, you know, so… If they still want me, I’ll definitely be there. 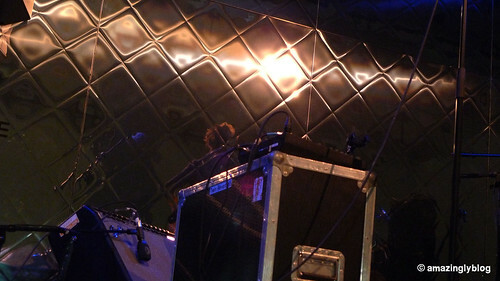 Nicolas: You played with Efterklang on the last tour, and not on the tour before. How did they come that they came to you to ask you to be involved in the projects? Audrey: How did you get in touch with them? P: I met them through MySpace actually. I was a huge fan and I had never been in Europe in my life. P: No, these days, it’s a nightmare. A few years ago, it had a practical use. I got in touch with the singer, he went in my page, listened to the music and he sent me a nice comment, and then I got really excited and asked if I can send them a CD. This was sort of kept in touch. It was really enough for me, I was thinking "This is incredible, they know who I am !”. And then out of the blue one day, they just invited me to move to Europe and tour with them. And they never even met me before or see me play, they just had the recordings I sent them. A: So, they already trust in you? P: I guess so, somehow they did, yeah. And that, sort of, what got me started my own musical career by doing this. C: What image do you think your music conveys and why did you choose to use this type of image for your music? P: Well, in general, I try not to choose an image for music, I try not to choose a type and I’m very much always trying to force myself to do different things and not to repeat what I did the last time. So for me, it’s about really exploration and hopefully a sense of wonder, sort of, you know, just, not so much being sure of something, but just letting it be what it is, if it makes sense. But it’s such a hard question with describing your own music. I can’t do it very well [general laugh]. I’ll let the sound speak for itself, you know. C: Yes, for me, it’s also very difficult to describe each band I want to introduce on the blog. P: Yeah, after you read so many descriptions, you can only have so many combinations of words to describe something. C: I have the feeling that I always use the same words to describe similar bands. P: Yes, it’s a little dangerous, I think, when you try to… That’s why I’m not so interested in music reviews, things like that. You can write all you want about something, but it’s not going to be. And the shame is that if you read a review and then listen to something, those words are going to stick in your mind and are going to influence on how you hear the music. But if you just leave it and you don’t bother trying to explain it so much, like you’re trying to say how good it is on a scale from 1 to 10 [general laugh], it’s possibly better. C: Do you know Brian Eno? P: Yeah, I love Brian Eno. C: Is he a major influence? P: Yeah ! BIG influence ! I didn’t actually start listening to his music until 2006 and I have a journal. There was one year I kept a journal. There was one page that just says by a hundred times “Brian Eno is a genius. Brian Eno is a genius. Brian Eno is a genius.”[general smile] At once, as soon as I discovered his music, I bought all the records. That year especially was a Brian Eno’s year for me. I’ve heard a lot of Brian Eno. C: Do you know that he came here to do a conference? P: This place ?! Wow, that’s fantastic ! C: Maybe it’s a difficult question... What is your stance on how to get the public to support live music and see your shows? P: It’s difficult, because I’m really not good of promoting things, and I’ve never been in a promoting mode. I think, with the Internet, there are so many tours that let people know about things, things that are going on. And I think that’s a big part of it nowadays. I think that most of it help people hear about concerts, I guess, it’s not so much word of mouth or a friend telling you sometimes, but you probably check out on the Internet before you go to a concert. But it’s far to let people getting to the show, sometimes it feels totally random, you know. You can promote something as hard as you want and there’s still maybe no people show up. I try not to think about how many people will be there. It’s fine if there are ten people and then it’s also fantastic. A: Maybe it’s too much pressure if you expect such a number of people. P: Exactly! You set yourself up for disappointment. Especially if you feel, like, you deserve, you know, those things. My attitude anyway is to try to just accept whatever happens. C: So were you surprised for today’s concert? P: Yes, there was a really really nice amount of people, it felt so intimate. And it’s only me, and there’s no other bands. In the past when I played in Paris, I was always, like, supporting an another band, so you never know how many people came there to see you and how many people came to see the other band. It was really nice to see that many people showed up. But I think it must also be an interest in this place in general, you know. I would hope, anyway, that this kind of people will start to get interested in this place and what happens, in a trust of a way to have good things, it seems like a place like that, maybe not all things you understand, but the quality and the art that has very good attention and feels too. C: The will of discovering new things. P: Yes, and to create new things. I mean, people creating work in here and staying for a week, even in the recording studio, it’s amazing. C: Tell us about the blog that attempts to list your whole discography! P: Yeah, almost. 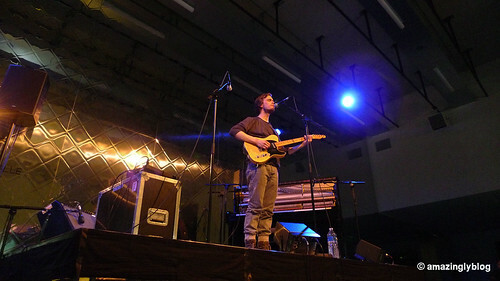 He’s even sort of doing some of my friends like Nils Frahm. I can’t quite understand it, but I very appreciate it. I’m sending him records as a trade, especially when he started, because when he started, he had to search and find anything that I was involved in. I imagine that it takes a lot of time. C: You work with tons of labels, how did that happen? A: Recently, what is your label? P: I guess… There are so many. My main records are coming out on Bella Union, a records from England. And I have a different label in the US called Hush Records, there’s Type Records I started releasing on, they released my first record and there’s the Swedish label, Kning Disk. A lot of others did little small projects, kind of little homemade labels that do handmade. A: So, it depends on the countries? P: It’s a bit like that. This label came from this country and the other label from this country. One label asked me if I wanted to make some music for a cassette tape. So I made a record specifically for a tape and one other label wanted me to do a little 3 inch CD, so I prepared a little music for that. Roman: Did you see the influence on the music depending on the format? P: Yeah, especially the tape thing. It’s good discussing it now. [general laugh] This isn’t just me on the spot. The tape especially did. I really record music thinking beyond the tape and in my mind, it had to be like that [tape called “Ten Duets”]. And if you work with vinyls, there’s a guy in New Zealand who makes, they’re not vinyls, but they’re like a homemade vinyl, like a clear CD that he cut by himself by hand. And he can do very small sizes like 5 inch records. And this, you can only fit 2 minutes of music per side. So I made some music for one of these and that very directly influences the time frame. P: You need a place where you explore different sort of works. Definitely. C: You seem to care about albums covers/cover art. P: Yes, of course I do. I’m actually someone, if I like records, I would go out and buy physical records. C: I brought with me your last album ["How They Are"], I find the cover very beautiful. P: This is really the 1st record for me that I felt 100% satisfied, the way it looked. All the other works, I really try and I got different artists involved. But this one, I took photos myself and I asked one of my favorite designers to put the whole things together. I’m really happy how it looks like. R: Who is the designer? P: His name is Rudger Zuydervelt. 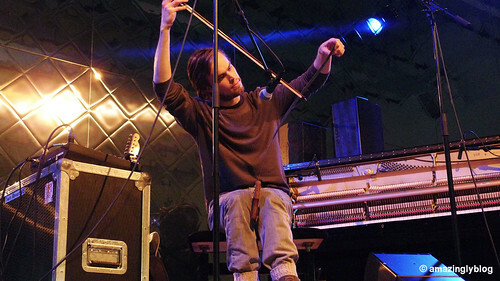 He’s musician, called Machinefabriek. We worked together. P: Yeah, he’s Dutch. He’s always designing his own stuff. The look of his releases is as important as the music itself. He creates a visual and style with his music. I love what he does. A: So, your pictures are yours? Where was it? P: Yeah, I made the photos, this was made in Copenhagen, February last year. It was the room I stayed for one month. I was in one of this little houses, it’s not this one, but it’s behind the photos. It was very very snowy and cold. And I just had surgery on my knee, it was a very rough period for me. Yeah, the photos have something special. C: Is your knee now better? P: Yeah, it’s a lot better! I don’t think it would be perfect again, but it’s fully functional. C: So you can jump? P: Yes, I can jump. I had three years to sleep with a pillow under my knee because I couldn’t stretch it all the way and now I don’t have to think about that. It was a long recovery process but it’s finally better. C: Ok. :) I also bring this ["Re:create series Vol.1"]. P: Oh yeah, this was the concept from the record label. 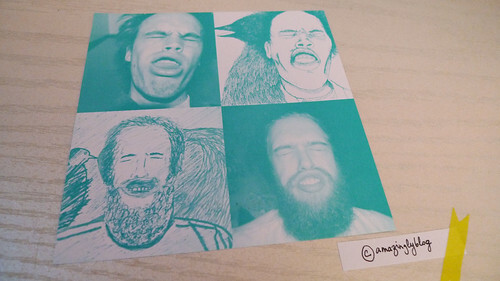 And actually when they first told me about this, well, me and Johan [Johan G. Winther, aka Tsukimono], we had already planned the concept of the record, we each took a picture, shaking our head with a flash, so the face looks really strange, and then we sent them to each other and he drew me and I drew him. We wanted the cover to be, like, one side/back side. Then the label wrote to us and said they had us the whole concept for the cover and we were kind like “aaah I don’t know about it” ‘cause we had this idea already. So, just like, this is part of the music to me, it’s the way it looks. The idea was part of it, but in the hand, I love what they did it. They found three hundred old 7 inch records and handscreen printed, all of them, our names in big letters just over the top, so each one is different. And there were some really really funny ones, all of them are Swedish. This one is Swedish on here. I think it’s a very special concept. C: Will you plan to do this kind of covers for your next releases or just simple and classic ones? P: I have no idea. I will make the decision when the time comes, I think. I’m not very sure at the moment with it. For the moment I don’t have any big things planned. I’ll have some time to think about the next thing. C: You did many collaborations. How did you meet the other musicians, like Johan? P: Johan? I met Johan because he plays in a band, we’ve been at the same festival, we have a mutual friend, and so I just sort of met him a few times here and there and we exchange music. This is a great way, a way to collaborate with lots of people, the way of meeting them. “Hey, let’s swap records!”, and then, you know, maybe you get inspired. These days, it’s so easy to just write to someone: “Hey, you want to send me a song and I record something, and email it back to you.” There are many options for collaborations. I’m always trying to explore that. 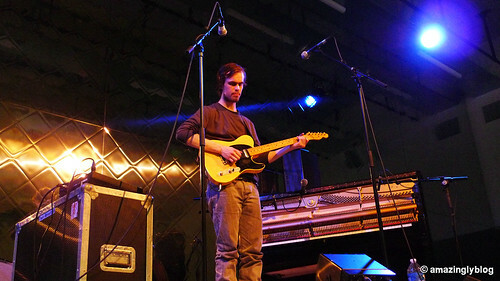 C: You collaborated with Machinefabriek, Nils Frahm and many others. And I watched a session you did in the Netherlands with Arone Dyer [from Buke & Gass]. Was it just a duet? P: She’s a friend and she lives in New York. She flew over just to play three concerts with me, and we wrote one song together. And this is one song that is on the session [song called “Old Time”, the session for KindaMuzik here]. N: What is the balance between the collaborations and your own work? What comes first? Do you work first for your own matter? P: It’s really a mix for them. Sometimes I don’t have any collaborations for months and really focus on my own work. And sometimes it’s day to day, different, one day, it’s my own stuff, one day, it’s next. I don’t have any specific way to do this. R: I wonder if you will work with your sister as well [Heather Broderick]. P: Yeah, I recorded and produced her record she has out and made a lot of the arrangements and playing the instruments as well. C: Have you ever thought of forming a band with your sister or with other musicians? P: Yeah, actually, I have been planning to put a band together and make a big tour in September, and Heather was supposed to be on that band, also Nils, and three other people, that’s going to be a six or seven-piece band, but I actually decided to cancel it about months ago, because of many many reasons. It will happen at some point, but I think for now I’m still kind of exploring what I do on my own and I’m enjoying doing that. In the way of putting a band together because I find out that it should be the next step, you know, because if you’re going to make a curve like this, you have to grow somehow, and I’m not ready to grow in that way. P: Yeah. I’m also afraid if I put a band together I will become a nightmare, something like “No, this should be like this! No, play like this! No, one more time!”. I don’t want to navigate in that space being over the top of people and controlling them, I think for the moment, when I’m not in the right space to approach that thing in a nice way. From time to time, I have musicians who join me on stage, one or two or three people. Putting a band to get on things and getting together, rehearsing for a month. Then we’re going on tour. And this was a little too much right now. R: Did you actually play in Japan afterwards? P: I’m still on the side whether I should go, the trip should be from April 14th to 26th, so I’m not sure, I’m waiting really to see what happens in the next couple weeks before. R: How long did you take to write the piece? P: That piece? I think I wrote it in a few days when I was staying at a friend’s house. I got the house and there was a piano there and I was just really enjoying the piano, banging in the piano, like this [moving his fingers in the air like playing piano]. And that piece came out. R: It is really good. It really captures the moment and the experience. C: What is the title? P: It is called “It’s The Storm When I Sleep”. 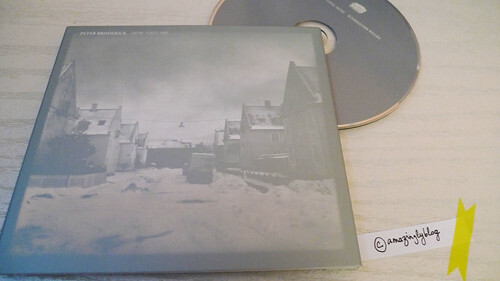 It was released on a split album that came out on the Japanese label just a month or two ago. It’s on there. I had copies yesterday, but I sold them all. N: Who is the other band on that split? P: It’s a Japanese singer-songwriter [Takumi Uesaka]. He does three songs guitar, kind of mellow guitar-voice. C: Is it the album called “Glimmer”? P: Yes, it’s out now in Japan but I think there will be separate European release dates, but I can’t remember exactly this right now. I think it’s very soon. A: You played in different atmospheres and different venues. Which atmosphere is the best for you? P: Always the best is the very intimate thing, where the stage is very small. It’s hard for me sometimes when there’s a huge stage or audience back there, and it’s hard to make a connection with the audience. For me, if there’s some kind of connection, whether it is real or not, I feel the success in a concert. With this kind of situation, small space and kind of relaxed as well, it’s always been the best. A: How did you deal when people are talking too loud? Does it happen for you? P: It really doesn’t happen often for me, and it probably happens ten times over the last year over a hundred of concerts. And in the most concerts I can’t be mean and tell them to stop. I just keep going on, you know. It’s not good at all, you know, the people who want to listen and who are in the first row. First of all, for this music, if you have silence, this adds a very strong element for me, the dynamic of going to absolutely nothing. And when there are people talking, that’s not possible. It really destroys it. P: Everybody is in their own world instead of getting everybody inside of this one thing for an hour. But I can understand it sometimes as well, you know. Sometimes it’s on the stage where the people in the very back can’t see, and with their friends and there’s the bar, and they have a conversation. C: I saw your pictures on Flickr [a space full of treasures], do you prefer to take pictures with a digital camera or do you prefer polaroids? P: I think that it’s very easy to love nowadays, it’s just to satisfy when you take a shoot that comes out right there and looks awesome. But in the hand, it can be any format. It’s not very fun taking photos with bad digital cameras, like Iphone, but I took some pictures that still look fine. But I prefer looking at it at an analog photograph, I can usually tell the difference, staying in touch with the physical element. C: What are your next projects? P: I think this year will be a little bit more relaxed. In the few years I’ve been releasing many many records and playing many many concerts and it’s, sort of, been my life. This year, in the summer, I’ll take a little break, maybe think about some other things, some other interests that I have and maybe travel a bit. I’ve never travelled somewhere, just to go there, you know, to have fun or do things. I always travel to play concerts, so I would like just to take a holiday, take a step back a little bit, sort of think about what happens next. There are some collaborations, some smaller things that are coming out this year, but I think, not a full album for a while. But it changes all the time for me, it comes with recording albums and they come out right away. I’m not very sure at the moment. A: It’s pretty exciting, your brain’s working on different projects, inspired to do something else, you can explore different atmospheres and stuff. So you don’t sound like anyone else. P: Yeah, and sometimes, I don’t even sound like myself. 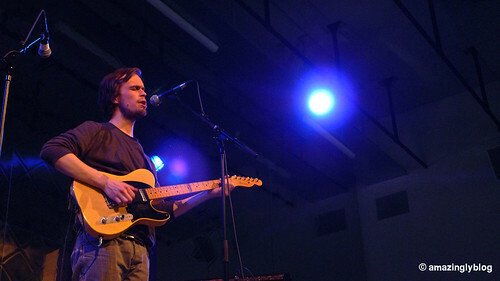 It’s interesting, I’m kind of curious to the outside people if there’s a Peter Broderick’s sound, because I feel, like, it’s all over the place. Especially with the records, like one will be piano and strings, and one will be only guitar and vocals. I kind of hope that it almost seems that it comes from a different person, I guess, in the end, it’s still my sense of melody and my sense of composition. Then, a 100% quick improvisation. I got the idea of the fill-in-the-blank game from the interview he did with Laura Veirs in 2009 for The Line of Best Fit. I highly recommend you to check out Hush Records' Youtube and watch the very good videos of Peter.